Our high pressure stove Inherent wind guard. 40 seconds to cook a dish. Dish result: fresh and crispy. Easy to tilt wok (one fundamental wok operation), applicable to both short and long handle woks. Simple, hygienic. 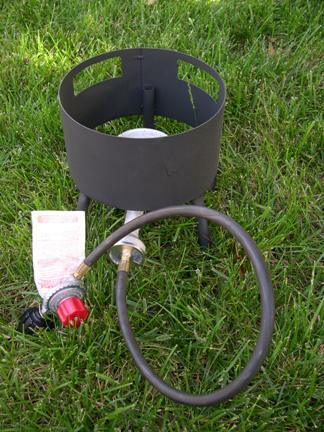 Good to tolerate outdoor, burner burns out small water residue and bugs. Max 40kW (137k BTU/hr). Butane stove No wind guard. 300 seconds to cook a dish. Dish result: soggy. not easy to tilt wok. simple, more to clean. not good for outdoor. Max 10kW (35k BTU/hr). 3-ring stove No wind guard. 105 seconds to cook a dish. Dish result: soft. difficult to tilt wok. medium, even more to clean. not good for outdoor. Max 19kW (60k BTU/hr). Backyard Chef Wind guard opposite to chef, sweat! 80 seconds to cook a dish. Dish result: soft. only suitable with long handle wok. most complex, most to clean. medium, small water and bugs clog burner holes (burner needs to be covered). Max 15kW (48k BTU/hr).